Diamonds are the usual go-to choice when it comes to engagement rings, but there are no rules that say engagement rings can’t be dressed up with a few other precious stones or gems. In fact, today many couples are opting to skip the diamond in favour of stones that they feel are more personal to them. And why shouldn’t they? There seems to be a misconception that the more you spend on an engagement ring the more … something … what is it again? The more you love your partner? The more manly you are? The more… Nope. I can’t find one that sounds right. So forget about the idea that it “must be a diamond” and “it must cost a lot of money” and get creative. There are some beautiful stones out there that represent the most beautiful of ideas. Doing a little research on your options might even turn out to be a lot of fun. 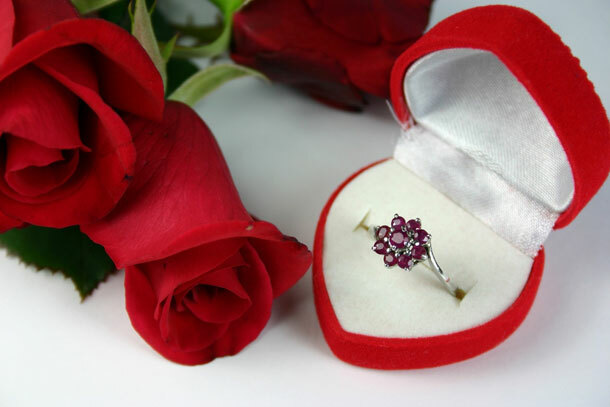 Red gemstones are said to represent pride, obstinacy, nobility and vengeance. Those thoughts might be a little scary, but when you look at the meanings of each kind of specific stone the ideals become a little more romantic. Rubies are associated with fire, passion and love and they are believed to open the heart and help the wearer overcome fear. They are also believed to protect friendship. While garnets mostly represent friendship, it was also once believe that wearing a garnet would ensure love and devotion from loved ones. Opals are believed to bring the wearer good fortune. Agates are believed to calm nerves and soothe the mind. This gemstone also represents Gemini on the Zodiac Calendar and it is believed to ensure the Gemini wearer long life, health and wealth. Yes, believe it or not, diamonds do come in shades of red. These diamonds are incredibly rare and it is highly unlikely that you will even find one. Red diamonds are said to represent confidence and power. These are positive traits, but not necessarily representative of two people promising to spend the rest of their lives together, so if you fail to find a red diamond you might consider going with a ruby as the “message” behind rubies is a little more romantic. Interesting post – I love the idea of precious stones and gems as an engagement ring and probably would have gone for that idea myself … if Id been given the option! I like diamonds and no colour, its simple and goes with everything … although I also love emeralds.. green is beautiful and If I was going to have colour, thats what it would be. I plan to give myself months to find the perfect ring! Wish me luck.